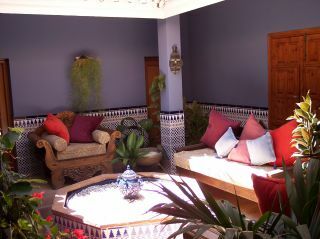 Casa Verde is a delightful Andalucian property in the classic style. It sits on the edge of and overlooking Alhaurin el Grande, one of the most picturesque towns in the Guadalhorce river valley. It backs on to a National Park - many kilometers of pine forests stretching all the way to the coast of Mijas. This property has everything you could need for either a leisurely or very active holiday. Close to the airport (Malaga 35 minutes), Marbella and the sea (35 minutes) and Mijas (20 minutes), activities such as golf, fishing, horse riding, walking and mountain biking are some of the easily accessible activities available on your doorstep. Alternatively you may prefer to rest in its tranquil surroundings. The pool is set in 3/4 acre of lovely mature gardens. The villa is about 1.5km from the center of Alhaurin, so a car is essential for shopping etc. The house sleeps 10 in 5 double bedrooms with ensuite bathrooms, one of which is on the ground floor. Fully equipped TV room, with Satellite TV (Sky), X-box, DVD, video and music system. We can arrange for wireless broadband connection for those who need to keep in touch. It also has a pool, gas BBQ area, mature gardens and a beautiful internal courtyard complete with fountain and lush greenery.